Who doesn't want to take Fridays off? A 4-day -- or compressed -- workweek is offered as an option to at least some employees at 43% of companies, according to the Society for Human Resource Management. But only 10% of those companies make it available to all or most of their employees. It's a perk more likely to be found at small companies, 14% of which make it available to all or most of their workers, while only 5% of large companies do the same. While the concept of a compressed workweek isn't new -- it's been common among nurses and emergency medical personnel, for instance -- it's not the norm for most jobs. But it has become a viable option as employers seek to expand their workplace flexibility menu. And it doesn't just benefit employees. Take Reusser Design, a 9-person Web app development company in Indiana that is open from 6:30 am to 5 pm Monday to Thursday. After reading about the idea, founder Nate Reusser consulted with his team and decided to try it. Reusser has found that the policy, now in place for two years, motivates everyone to work faster and with greater focus -- much like the way people work just before going on vacation, he said. And the extended hours let the company's Web developers concentrate on a project for longer periods of time uninterrupted. "You wouldn't believe how much we get done," Reusser said. He estimates that he and his staff might end up working overtime once a year or so. And he acknowledges that with such tight scheduling to complete client projects, it can be tricky when a staff member calls in sick during one of the four work days. But it's worth the tradeoff, he said, because the policy has been a great talent acquisition and retention tool, since none of his company's Midwest competitors offer a 4-day workweek. Project management Web toolmaker Basecamp, which has 47 employees, institutes a 4-day workweek from May through August for staffers who have been there at least a year. And -- bonus -- they only have to put in 8-hour days during those summer months. Offering a compressed workweek may require new kinds of oversight -- not only to ensure that productivity is maintained, but to stagger staff schedules so a company can operate five days a week if need be. And larger companies especially need to make sure the workweek is set up in a way that won't violate federal and state laws regarding overtime and holiday pay. Among large employers, global audit, tax and advisory firm KPMG, offers a compressed workweek option to its U.S. employees. "We recognize it's a win-win for the company and the employees," said Barbara Wankoff, KPMG's director of workplace solutions. "Their satisfaction goes way up when they have control over their time. And it increases employee morale and productivity and retention." But it's not a given that someone at KPMG can work a compressed week. It's an arrangement that has to be worked out between employees and their managers. Related quiz: Do you have good work-life balance? 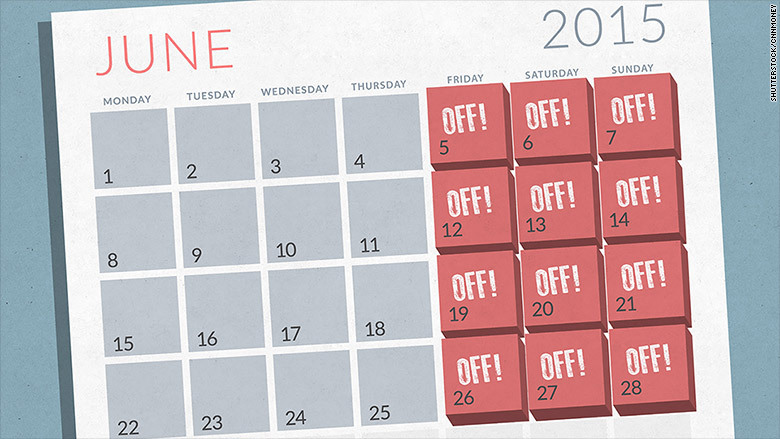 The 4-day workweek isn't limited to the private sector. The U.S. Government Accountability Office offers it too. Often GAO employees put in eight 9-hour days, then one 8-hour day before taking a day off, a GAO spokesman said. Or they may choose to work four 10-hour days each week. And there are roughly two dozen local union contracts that include a compressed workweek option for public-service employees working in municipalities, universities and institutions such as prisons, according to the American Federation of State, County and Municipal Employees.